There is a long and rich history of mining and energy development in the Upper South Platte Watershed. CUSP promotes responsible mining practices and ecologically sound mine reclamation to protect water quality and ecological health. We work with a variety of private and government partners to assess mining impacts, and to perform reclamation and revegetation in priority mining areas. 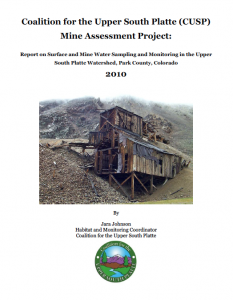 Support mine assessment reclamation by learning more below, volunteering, and donating today. With financial support from the Colorado Water Conservation Board and the Healthy Rivers Fund, CUSP identified the water quality impacts of historical mining throughout the watershed. In addition to outlining water quality impacts, the report also identifies priority mine sites and a monitoring strategy to further characterize problem sites to facilitate management and remedial decisions. The information gathered for the report informs ongoing monitoring, reclamation, and revegetation efforts.